Texas is known for its fondness of the Friday night lights of high school football, and a big part of what makes those games so spectacular are the marching bands. The band's job doesn't end at performing a fancy halftime show; they also help rile the crowd up to cheer on the team. The band plays songs that the cheerleaders and drill team dance to, and they do all of this while outfitted in sweltering uniforms, balancing elaborate hats and sometimes strapped into enormously heavy instruments. With that in mind, here are just 10 of the dozens of incredible and award-winning Texas high school marching bands from across the state. *The information in this article is based on available data from the University Interscholastic League (UIL) state competitions for the past five years, from 3A-6A sized high schools. The North Lamar High School Panther band has won numerous accolades for their marching routines. North Lamar High School has placed in the top 10 marching band competitions for 3A high schools in the state of Texas for the past three competitions (since 2010, competitions are held every other year). The Spirit of Waxahachie Indian Band has placed in the top 10 for the past three 5A/6A UIL competitions, and they have secured many other awards and accomplishments. The Woodlands High School band has been honored twice by the John Philip Sousa Foundation; ranked in the top 10 in the past three UIL competitions for 5A/6A high schools in Texas; and won the Bands of America Grand National Championship in 2013. The northwest Dallas suburb of Coppell has produced one of the top marching bands in the state of Texas. They've ranked in the top 10 for the past three UIL state competitions for 5A/6A high schools. The Coppell Under the direction of Scott Mason for over 25 years, the Coppell High School Band has achieved many honors, including marching in the 2001 Tournament of Roses parade in California. In 2004, the band was invited to march in the St. Patrick's Day parade in Dublin, Ireland. The Wakeland High School band in Frisco, Texas has achieved a top 10 ranking in the past three UIL competitions for 4A high schools. In 2008, the band traveled to Branson, Missouri to participate in the Ozark Showcase of Music, and they traveled to New Orleans the following year to participate in the Cajun Showcase of Music. Austin's Bowie High School band has placed fourth in the past three state UIL competitions for 5A/6A high schools in Texas. The band also marched in the 2015 New Year's Day Parade in London, England. In 2008, the Bowie High School band participated in the Macy's Thanksgiving Day Parade in New York City. The South Houston suburb of Friendswood has placed in the top 5 in the past three UIL state competitions for 4A high schools. The school has since grown and changed its classification to a 6A school. 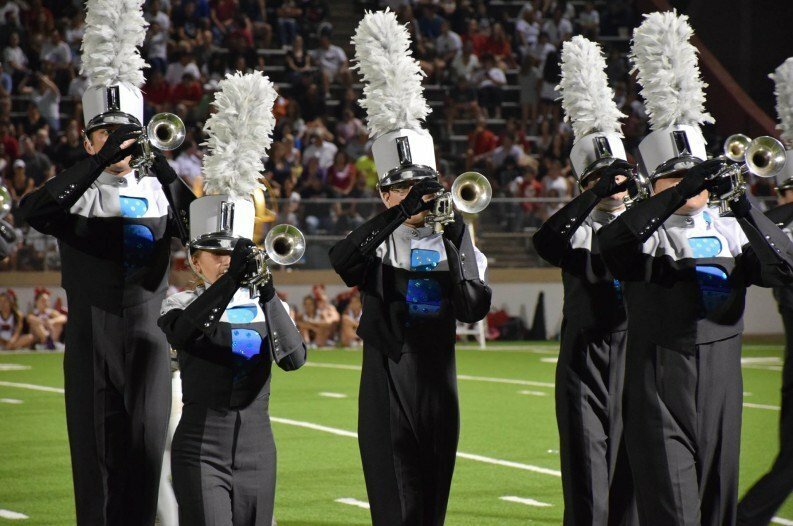 This high school in the Dallas suburb of Carrollton has ranked in the top 10 in the past three UIL competitions, including twice in the second place spot. The Hebron Band was honored by the John Philip Sousa Foundation in 2012 and has often been a "Best in Class" award winner at UIL competitions. The Argyle High School band in Argyle, Texas won first place for 3A high schools in 2010 and 2012 at the state UIL competition. The small Dallas suburb has since grown in size, and it is now a 4A school. Of the large high schools in Texas, Marcus High School in Flower Mound is a difficult one to beat. In fact, the Marcus band has placed first in the last five state UIL competitions for 5A/6A high schools in Texas and ranked fifth in the 2013 Bands of America Grand National Championship. Under the leadership of Amanda Drinkwater for the past 10 years, the band has flourished and continues to win numerous state and national honors.